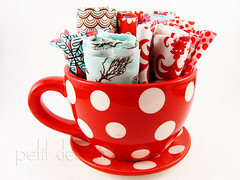 Petit Design Co: Too Much Fun? This morning Mr. PD had to go in to work (very rarely does he have to work weekends) so left up to my own devices I had a little bit too much fun with the new light box I built. 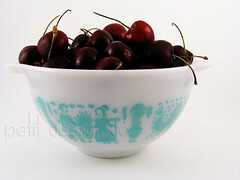 First I pulled out my vintage Pyrex and the super delicious cherries I got from the grocery store yesterday. Delicious! 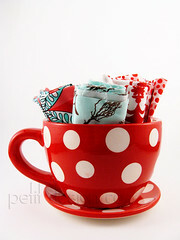 Then I pulled out my cute red polka dot planter and some of my favorite red and aqua prints. Then I moved on to bananas, mangoes, and summer squash! I need to edit those pics first though. Let me know if you have any interest in learning about using/making a light box and I'll write up a post if anyone wants to know. 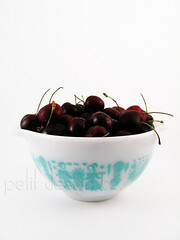 I'd love to see a tutorial on making a lightbox. I've been feeling an itch to make one recently! I agree, I'd love to learn how to make a lightbox. Yes, please, share a tutorial with us. 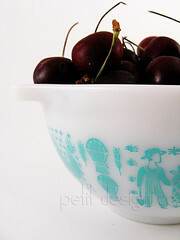 I'd love to have a lightbox!